Elemental elegance. An exploration of mixed metals, Wiener Werkstatte austerity, and futuristic glamour. A steel x-base with mod circle cutouts supports a brass sphere fixture. Brass banding on the shade adds an extra layer of Machine Age modernism. Glamorous enough for a Park Avenue penthouse, but elemental and austere enough for an Industrial loft. Specs: Shade measures 18 in. diameter x 12 in. H Oyster faux silk shade with polished brass banding One 75W max, type A bulb (not included). 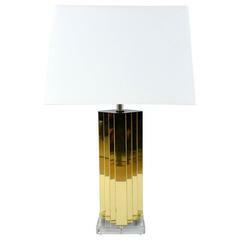 Italian pair of table lamps in brass and steel In the manner of Willy Rizzo, circa 1970. 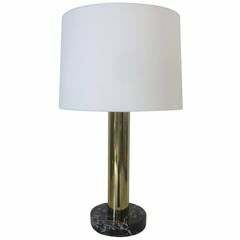 A brass and dark veined marble based table lamp with off-white linen shade manufactured by Nessen Lamp Company, NY. French brass table lamp with ceramic artichoke leaves and a black and gold linen shade. In the manner of Maison Charles. France, 1950s. .